For many years, the art, skill and practice of dentistry was centered around saving teeth from advanced dental diseases if possible and if not, then replacing them with the next best thing, removable dentures or partial dentures. Dentures are acrylic plates with attached artificial teeth that are customized and formed to fit in the missing teeth spaces and replace chewing. 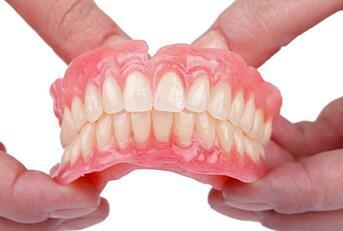 Beautiful dentures, provide the esthetics to give you more confidence in your smile. Beautiful dentures are constructed with not only comfort and chewing function in mind but also to create beauty and a naturally life like appearance. This gives the patient a confident smile and restores self-assurance that is commonly lost when the natural teeth were lost. If you are wearing an old denture that is not fitting, has become discolored or is broken, please call us at (281) 494-9400 and we’ll help you get your beautiful dentures right away. Bring a life like appearance to the smile. The jaw arch form that has lost all teeth can be used as a platform for the replacement of teeth using an acrylic base that is colored to match the patient’s gingiva or gums. Artificial teeth are positioned and attached to this plate so they can be used to chew against the opposing teeth. This is a full or complete denture. The jaw arch form that is missing many teeth but not all can be used as a platform for the replacement of teeth using an acrylic base that engages the existing healthy teeth allowing more retention and also replacing the missing teeth. This is a partial denture. With time, both partial and complete denture wearing will cause the jaw arch to deteriorate due to the chewing friction of the inner denture against the soft gum tissues. Consequently the dentures no longer fit. Today we have dental implants that can be surgically placed into the jaw bone and used with snap connectors to support the denture and eliminate this jaw worsening. This stabilizes the dentures and gives the denture wearing patient greater confidence and chewing function.